For a long time, the corporation that stood out as America’s worst employer was Walmart, given its reputation for shortchanging workers on pay, engaging in discriminatory practices and ruthlessly fighting union organizing drives. Today, Amazon.com seems to be trying to take over that title, at least for its blue-collar workforce. Yet when we look at the corporations that have been paying the most penalties for workplace abuses, there is another contender for the top, or really the bottom, spot among U.S. employers: Bank of America. In Big Business Bias, a report just published by the Corporate Research Project of Good Jobs First, we found that BofA has paid more in damages, settlements and fines in workplace discrimination and harassment cases than any other large for-profit corporation. In Grand Theft Paycheck, a report we published last year on wage theft, BofA ranked third (after Walmart and FedEx) in total penalties paid in private wage and hour lawsuits and cases brought by the U.S. Labor Department. BofA’s position in these tallies is to a significant extent the result of cases brought against its subsidiary Merrill Lynch, which the federal government pressured it to acquire during the financial meltdown in 2008. Merrill accounts for 95 percent of the $210 million in penalties BofA has paid in discrimination cases and more than one-quarter of the $381 million paid in wage theft cases. Merrill brought with it problems beyond questionable personnel practices. In 1998 it had to pay $400 million to settle charges that it helped push Orange County, California into bankruptcy with reckless investment advice. In 2002 it agreed to pay $100 million to settle charges that its analysts skewed their advice to promote the firm’s investment banking business (plus another $100 million the following year). In 2003 it paid $80 million to settle allegations relating to dealings with Enron. This track record was similar to that of BofA before the merger. For example, in 1998 the bank paid $187 million to settle allegations that in its role as bond trustee for the California state government it misappropriated funds, overcharged for services and destroyed evidence of its misdeeds. BofA later paid to settle lawsuits concerning its dealings with Enron ($69 million) and another corporate criminal, WorldCom ($460 million). In the wake of the financial crisis, BofA had to enter into several multi-billion-dollar settlements concerning the sale of toxic securities and various mortgage abuses. It is for all these reasons that BofA tops the Violation Tracker ranking of the most penalized parent companies, with payouts of more than $58 billion. BofA is not unique in this respect. Another major bank is also one of the ten most penalized corporations overall as well as high on the lists of those with the most penalties related to workplace discrimination and wage theft. That bank is Wells Fargo, which ranks sixth on the Violation Tracker list with over $14 billion in penalties, ninth in the discrimination tally with $68 million and fourth in the wage theft tally with $205 million. Wells Fargo, of course, is notorious for creating millions of bogus accounts to generate illicit fees and other deceptive practices. Last year, the Federal Reserve took the unprecedented step of barring the bank from growing any larger until it cleaned up its act. The agency also announced that the bank had been pressured to replace four members of its board of directors. Bank of America and Wells Fargo demonstrate all too clearly that mistreatment of customers can go hand-in-hand with mistreatment of workers. The bankruptcy filing, store closings and general uncertainty surrounding the future of Sears have prompted a spate of nostalgic business-page articles about the history of the once dominant retailer. Whether or not the chain survives, it is important not to sugarcoat its past. Sears, along with Montgomery Ward, brought the joys of mass-produced merchandise to rural America. Yet its mail-order operations undermined local merchants and initiated the long-term decline of traditional main street life. Sears’ hyper-efficient system for fulfilling mail orders, using conveyor belts and pneumatic tubes, was said to have helped inspire Henry Ford’s automobile assembly line with its mixed blessings. Sears began opening retail stores in the 1920s, and in the postwar period it played a major role in automobile-focused suburbanization and its attendant social and environmental impacts. The company would later extract a $242 million subsidy package to relocate its headquarters from downtown Chicago to exurban Hoffman Estates after threatening to move out of state. In the 1980s Sears was one of the prime examples of wrong-headed diversification as it acquired the Dean Witter brokerage house and the Coldwell Banker chain of real estate agencies, and then introduced the Discover credit card. During the 1990s Sears had to dispose of all those businesses, along with its Allstate insurance operation. In 2005 Sears suffered the indignity of being combined with Kmart by private equity operator Edward Lampert, who believed he could solve the longstanding problems of the two chains but instead ended up simply stretching out their death spiral. Sears had long resisted unionization of its stores, but it adopted paternalistic practices such as profit-sharing that partly substituted for collective bargaining. During the Lampert era there has been little paternalism. Instead, workers at Sears and Kmart have frequently found themselves the victims of abusive labor practices. Since 2007 the two chains have been implicated in nine collective action wage theft lawsuits and have had to pay out more than $56 million in settlements and damages – more than any other broadline retailer except Walmart. During the Lampert era the two chains have also been cited more than 50 times by OSHA for workplace safety and health abuses, paying some $600,000 in fines. They have also been involved in five cases with the Equal Employment Opportunity Commission, including one in which Sears had to pay $6.2 million in 2010 to settle allegations of widespread violations of the Americans with Disabilities Act. Sears has also gotten into trouble in its dealings with the federal government. In 2017 Kmart had to pay $32.3 million to resolve allegations that its in-house pharmacies violated the False Claims Act by overbilling federal health programs when filling prescriptions for generic drugs. Sears has played a significant role in the history of American retailing, but it has not always been a positive one. Now that its days appear to be numbered, we can focus our attention on the newer generation of bad actors, such as Amazon, that now dominate the system in which we obtain the necessities of everyday life. The Trump Administration has left little doubt that one of its main missions is to roll back the regulatory initiatives of the Obama years, especially the Clean Power Plan and the Consumer Financial Protection Bureau. Although Trump has been less overt about it, his corporate-friendly approach also includes weakening rules that have been around for decades. An important case in point concerns the Fair Labor Standards Act, the key federal wage and hour law that was signed into law 80 years ago by President Franklin Roosevelt. The culmination of decades of struggle over excessive workweeks, inadequate pay levels and child labor, the FLSA put the federal government in the business of combatting wage theft and other forms of workplace exploitation. It accomplished that through a system of workplace investigations and the imposition of financial penalties on employers large and small. In a move that has received limited attention, the Trump Labor Department is seeking to replace rigorous enforcement with a system called Payroll Audit Independent Determination (or PAID) that puts employers on the honor system. Beginning with the dubious premise that wage and hour violations mainly derive from inadvertent mistakes made by managers, PAID will encourage employers to report irregularities on their own. When they do they will still have to pay back wages but will not be assessed damages or penalties. Such a system makes a mockery of real enforcement. What makes matters worse is that PAID, which is being billed as a pilot program for now, is being pursued right after the U.S. Supreme Court’s disastrous Epic Systems ruling. That decision affirms the right of employers to compel workers to sign mandatory arbitration agreements that would severely curtail their ability to bring collective action lawsuits. As my colleagues and I at the Corporate Research Project and Jobs With Justice Education Fund showed in a recent report, these lawsuits have allowed workers to recover billions of dollars from large corporations. PAID was featured in a recent NBC News feature on how the Trump Administration is relaxing regulatory enforcement in numerous areas. This prompted a group of Democratic Senators to express concern about PAID to the DOL, whose spokesperson responded that it was “premature to comment” on the program. The controversy over PAID comes amid growing concern about the prevalence of wage theft. Some of those abuses apparently exist right inside the federal government. The Labor Department, which has not yet left the investigation business, is reported to be examining the practices of a company called Seven Hills, which manages the food court at the Pentagon. Faced with the prospect of diminished DOL enforcement and restrictions on lawsuits, activists are looking to other solutions. Some of the most encouraging work is happening at the local and state levels. For example, Centro de Trabajadores Unidos en la Lucha (Center for Workers United in Struggle) is pressing Minneapolis Mayor Jacob Frey and the City Council to pass an ordinance dealing with wage theft. In some parts of the country, law enforcement officials are taking the term wage theft literally and treating it as a criminal offense. For example, after a joint investigation by the Washington State Attorney General’s Office and the Department of Labor & Industries, a construction company and its owner pled guilty last month to a criminal charge of first-degree theft. Earlier this month, the New York Attorney General and the Inspector General of the Port Authority announced the arrest of a contractor for failing to pay prevailing wages at a publicly-funded construction project at LaGuardia Airport. While it would be terrible to see DOL’s wage and hour enforcement system dismantled, there are other ways rogue employers can be brought to justice. Donald Trump’s blue-collar supporters may like what they are seeing on Fox News, but when they arrive at work the MAGA revolution is nowhere to be found. Far from empowering labor, the Trump Administration’s employment policies are heavily skewed toward management. The aspect of this I’ve been focusing on lately are wage and hour issues. Recently my colleagues and I at the Corporate Research Project and Jobs With Justice published Grand Theft Paycheck, a detailed look at wage theft by large corporations. We found that major employers in a wide range of industries continue to pay out large sums in collective action lawsuits, which indicates that they continue to violate the Fair Labor Standards Act by compelling employees to do off-the-clock work and denying them proper overtime pay. Such litigation may soon be a thing of the past. There are signs that collective actions are failing in the wake of the U.S. Supreme Court’s Epic Systems ruling, written by Trump nominee Neil Gorsuch, affirming the right of employers to use mandatory arbitration to block group lawsuits. For example, a federal judge in California told a group of Domino’s Pizza drivers that they had to use arbitration rather than litigation to resolve their claims against franchise owners. At the same time, instead of intensifying enforcement by the Wage and Hour Division, Trump’s Labor Department is promoting a new approach based on corporate self-audits and fewer fines. Allowing employers to operate on the honor system is just another way of weakening enforcement. A new report from the National Employment Law Project shows that the Trump DOL is also reducing enforcement of workplace safety and health rules. NELP found that OSHA enforcement activity in FY2017 was down compared to the previous year. The decline was even more pronounced during the first five months of FY2018, when the number of enforcement units (the measure used by OSHA) fell by more than 7 percent. This trend is likely to worsen, since NELP notes that the number of OSHA inspectors has been declining. Federal workers are facing an assault of their own. Trump recently announced plans to overhaul rules affecting more than two million employees, making it easier to discipline and fire them. The move also includes an attack on federal unions through stricter limits on the amount of time grievance officers and other activists can spend on union activity during working hours. The next blow will come in the Supreme Court, which is expected to issue a decision soon in the Janus case that blocks the ability of public sector unions to collect fees from employees who decline to join but still benefit from collective bargaining agreements and other protections negotiated by those unions. Such a ruling could have a devastating financial impact on public unions. As bad as all this sounds, it could boomerang on Trump and his corporate allies. More workers may follow the example of the teacher wildcat strikes and put their faith in self-organization rather than a demagogue. For the past two decades, Walmart has repeatedly been accused of compelling workers to perform certain tasks off the clock and has paid numerous fines for those practices. It is often suggested that the retailer is an anomaly, acting more like a fly-by-night sweatshop than a corporate giant. I recently completed a research project showing that, on the contrary, off-the-clock work, denial of overtime pay through misclassification and other forms of wage theft are pervasive in American big business. After digging through court records for much of the past year, I found more than 1,200 successful wage and hour lawsuits against hundreds of the country’s largest employers. These collective action suits have yielded some $8.8 billion in settlements and verdicts in the period since 2000. The same group of corporations have paid around $400 million in fines to the U.S. Department of Labor. These findings are contained in Grand Theft Paycheck, a report just published by the Corporate Research Project of Good Jobs First and the Jobs With Justice Education Fund. The data has also been incorporated into Violation Tracker. Among the dozen most penalized corporations, Walmart, with $1.4 billion in total settlements and fines, is the only retailer. Second is FedEx with $502 million. Half of the top dozen are banks and insurance companies, including Bank of America ($381 million); Wells Fargo ($205 million); JPMorgan Chase ($160 million); and State Farm Insurance ($140 million). The top 25 also include prominent companies in sectors not typically associated with wage theft, including telecommunications (AT&T); information technology (Microsoft and Oracle); pharmaceuticals (Novartis); and investment services (Morgan Stanley and UBS). Due to Walmart, retailing is the industry with the highest aggregate penalties ($2.7 billion) imposed on large companies. It is followed by financial services ($1.4 billion); freight and logistics ($828 million); business services ($611 million); insurance ($557 million); miscellaneous services ($486 million); healthcare services ($417 million); restaurants and foodservice ($397 million); information technology ($335 million); and food and beverage products ($315 million). More than 100 large corporations have paid penalties in three or more collective action lawsuits. Bank of America and its subsidiaries did so two dozen times. Although there are fluctuations from year to year, the lawsuit penalty total reached a high of $1.3 billion in 2016. The tally in 2017 was $732 million, the fourth-largest yearly total. There have been seven individual settlements in excess of $100 million, including the $640 million omnibus settlement by Walmart of more than 60 lawsuits and two FedEx settlements each in excess of $200 million. Since collective actions are usually settled before trial, there are few verdicts. But Walmart leads in that category too, with a judgment of $242 million. It has also paid the largest single fine: $33 million to the U.S. Labor Department. 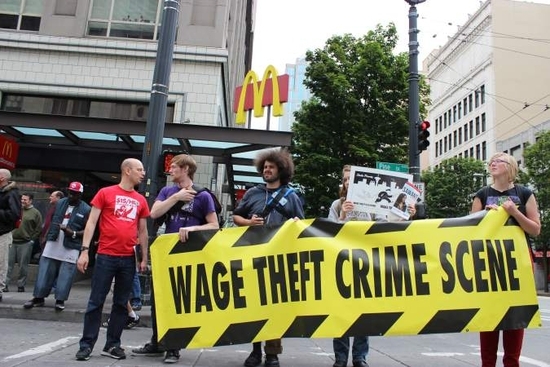 The occupations represented in wage theft lawsuits range from low-wage jobs such as cashiers, cooks and security guards to higher-paid positions such as package delivery drivers, nurses, pharmaceutical sales representatives, and financial advisors. The totals and rankings are based on penalties that were publicly disclosed, though the report documents 127 cases involving 89 large companies that petitioned courts to keep the details of their wage theft settlements confidential. AT&T, Home Depot, Verizon Communications, Comcast, Lowe’s and Best Buy each had multiple sealed settlements. Of the ten most penalized industries, all but two—freight and information technology—employ large numbers of women, according to the Bureau of Labor Statistics. Several of these industries—especially business services, insurance and healthcare services—are predominantly female. In about half of these top ten industries, the percentage of Black and Latino workers is greater than in the workforce as a whole. For example, Black workers account for about 12 percent of the overall workforce but 20 percent of the labor force in business support services and 17 percent in freight. Latino workers account for about 17 percent of the overall workforce but about 25 percent in restaurants and foodservice and 29 percent in food and beverage production. Many companies accused of wage theft are highly profitable. Among the dozen most penalized corporations, all but two had an annual net income of more than $2 billion in their most recent fiscal year. AT&T, JPMorgan Chase and Wells Fargo each had more than $20 billion in profits. These companies pay their chief executives generous salaries and bonuses. CEOs at AT&T, Bank of America, JPMorgan Chase and Walmart receive annual compensation of more than $20 million each. Companies such as these can afford to pay their workers properly. It is time for Corporate America to remove wage theft from its business model. Donald Trump built his presidential campaign on the claim that he would be a champion for working people, yet his administration finds one way after another to tip the scales in favor of employers. The latest example involves tips themselves. In December the Labor Department, bowing to the wishes of the National Restaurant Association, proposed to rescind an Obama Administration rule that prohibited employers from pooling tips. The rule had been adopted to prevent restaurant owners from claiming a share of the gratuities. While the DOL has claimed that the change would benefit back-of-house workers who don’t directly receive tips, groups such as Restaurant Opportunities Centers (ROC) United say that employers often grab a portion of tips when it is not permitted and that legalizing the practice will only encourage owners to take more. It turns out that ROC United’s position is shared but some at DOL, but those views are being suppressed. Bloomberg has just reported that political officials at the department rejected an internal analysis concluding that workers could lose billions of dollars from tip pooling. DOL sources told Bloomberg that the officials ordered staffers to change their methodology to reach a different conclusion. Anyone who takes an honest look at the restaurant industry is bound to conclude that employers will do their utmost to exploit tip pooling. After all, these are companies that already steal from their workers through violations of wage and hour rules concerning off-the-clock work, overtime, misclassification and the like. Consider the large full-service chains such as Darden Restaurants (Olive Garden, Capital Grille and other brands), Brinker International (Chili’s and Maggiano’s), Bloomin’ Brands (Outback Steakhouse and others) and DineEquity (Applebee’s and IHOP). As shown in Violation Tracker, each one of these has had to pay fines to the DOL’s Wage and Hour Division; six times in the case of DineEquity. The chains have also been targeted in private collective action lawsuits brought by groups of workers. In 2007 Darden agreed to pay $11 million to settle a group of suits alleging that the company improperly classified certain types of workers as exempt from overtime pay eligibility. In 2014 Brinker International agreed to pay $56.5 million to settle a long-running lawsuit alleging that the company had routinely violated California rules about meal and rest breaks. In 2016 Bloomin’ Brands agreed to pay $3 million to settle allegations that workers at its Outback outlets were required to show up early to perform unpaid pre-shift prep work. DineEquity has faced similar litigation. Why would anyone think that companies involved in such transgressions would pass up another opportunity to enrich themselves if DOL gives a green light to tip pooling? Donald Trump got a lot of mileage during his presidential campaign from criticizing the poor record of wage growth during the Obama era. Since taking office he has done nothing to directly address the issue. In fact, his administration’s attacks on labor rights have made it more difficult for workers to push for higher pay through unions. Instead, Trump and his Republican allies in Congress came up with the cynical ploy of promoting their massive corporate tax giveaway as an indirect way of boosting paychecks. The right has always tried to lure labor with the promise of higher net pay that would come from reduced withholding schedules. Yet this time the claim was that companies would respond to reductions in their tax liabilities by boosting gross pay. From the perspective of labor market dynamics, this made no sense whatsoever. There is no direct tie between corporate tax rates and wage levels. Most of the U.S. public seemed to understand this and expressed little enthusiasm for the tax bill. Now, however, selected corporations are in effect colluding with Trump by announcing selective wage increases that they claim are inspired by the corporate tax reductions. Walmart is the latest and largest of the employers to play this game with plans to increase starting wages for its “associates” to the princely sum of $11 an hour. Some employees will be awarded one-time bonuses ranging from $200 (for those on the job for less than two years) to $1,000 for those hardy souls who have stuck it out for 20 years. This plan, like the ones announced by the likes of AT&T and Wells Fargo, is far from a market response to lower taxes. These companies are no doubt using the increases to curry favor with the White House in the hope of better outcomes in their federal regulatory problems. Then there’s the fact that these are increases that Walmart in particular had to make in response to previous wage hikes at its competitors. Even so, Walmart’s increases will leave many of its employees short of a living wage. Another reason to doubt these moves are tax-inspired acts of generosity is that the companies involved each have a history not only of keeping wages down but of taking steps to deny workers the full pay to which they were entitled. In other words, all three have a history of wage theft. Walmart, of course, was long the most notorious employer in this regard. It found myriad ways to get employees to work off the clock, thus violating the minimum wage and overtime provisions of the Fair Labor Standards Act. 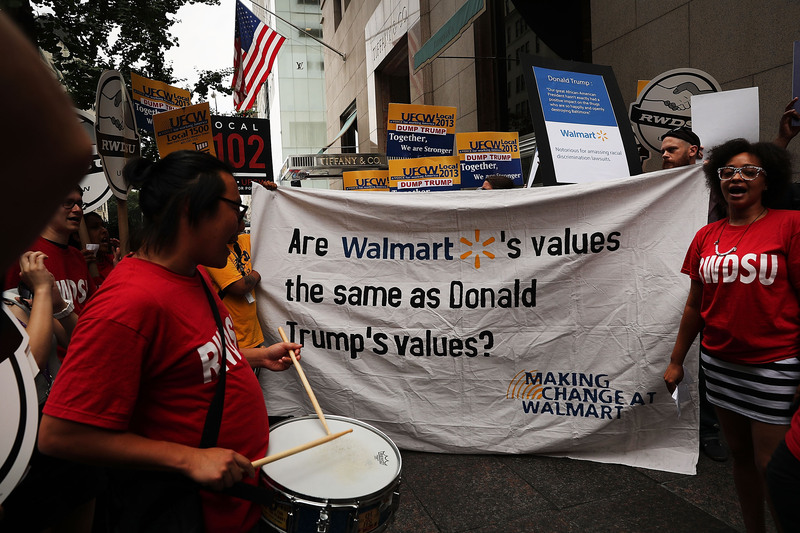 In the late 2000s Walmart was fined $33 million by the Department of Labor’s Wage and Hour Division and paid out hundreds of millions of dollars more to settle a slew of private collective-action lawsuits. AT&T and its subsidiaries have paid out more than $80 million to settle about a dozen similar wage and hour and misclassification cases. Wells Fargo and its subsidiaries have paid more than $120 million in at least 17 cases. These settlements provided some necessary relief, but the amounts probably don’t begin to approximate the full extent to which the companies shortchanged their workers. Consequently, whatever voluntary pay increases the companies are offering now can be seen as additional reparations for their past sins of wage theft. If the management of Walmart really wanted to solve its compensation shortcomings once and for all, it would at long last recognize the right of its workers to form a union and bargain collectively. Note: the litigation figures cited here come from data being collected for a forthcoming expansion of Violation Tracker. Several weeks ago, in one of his few legislative successes, President Trump signed a bill rescinding the Obama Administration’s executive order on Fair Pay and Safe Workplaces. The order, designed to promote better employment practices by companies doing business with the federal government, instructed procurement officials to consider the labor track record of contractors, which were required to disclose their recent violations. Business groups, which had attacked the order as a form of blacklisting, have gotten their way, but it is still possible for a federal procurement officer to determine whether a bidder is a rogue employer. It’s simply a matter of plugging the company’s name into Violation Tracker, the free database on corporate crime and misconduct I have assembled with my colleagues at the Corporate Research Project of Good Jobs First. We’ve just announced the latest expansion of the database: 34,000 Fair Labor Standards Act cases brought since the beginning of 2010 by the Wage and Hour Division of the U.S. Labor Department. The dataset, covering cases with back pay and penalties of $5,000 or more, represents the recovery of more than $1.2 billion by WHD investigators. Many of the offending employers are smaller businesses, but wage theft is far from unknown among large corporations. The biggest cumulative amounts collected by the WHD since 2010 came from oilfield services company Halliburton, which in 2015 agreed to an $18 million settlement of alleged overtime violations, and CoreCivic (the new name of private prison operator Corrections Corporation of America), which in 2014 agreed to an $8 million settlement. Also among the top ten are Walt Disney ($4.2 million) and Royal Dutch Shell ($2.6 million). The wage and hour cases supplement existing Violation Tracker data in two other key areas that had been included in the executive order: workplace safety (OSHA cases) and employment discrimination (cases brought by the Equal Employment Opportunity Commission and the Office of Federal Contract Compliance Programs). We are now in the process of obtaining data on the remaining category — unfair labor practice cases — from the National Labor Relations Board. DOL administrative actions are not the only game in town when it comes to challenging wage theft, which a 2014 Economic Policy Institute report estimated could be costing U.S. workers as much as $50 billion a year. Some of the biggest recoveries come in lawsuits known as collective actions that are brought in federal court on behalf of groups of workers and often result in multi-million-dollar settlements. Unfortunately, there is no central information source on these settlements. The Corporate Research Project is in the process of piecing together the data from multiple sources and will add it to Violation Tracker later this year. The issues covered by the Obama executive order are just a portion of what can be found in Violation Tracker. We now have 158,000 cases brought by 42 federal regulatory agencies and all divisions of the Justice Department. The fines and settlement amounts in these cases total more than $320 billion. Violation Tracker data is now current through late March of this year, but for some agencies there was not a lot of case information to collect for the first two months of the Trump Administration. For example, the Wage and Hour Division, which in recent years usually announced numerous case resolutions each month via press releases, has posted only a handful of such releases since Inauguration Day. There’s no indication that the work of the division has stopped, but it appears that the Trump appointees now running the Labor Department are not eager to publicize enforcement activities. Once upon a time, a key component of American populism was the demand for stricter controls over big business: in other words, regulation. Today, the country’s purported populist in chief is instead promoting the dubious claim that deregulation is what will benefit the masses. Through executive orders and now with his administration’s budget blueprint, Donald Trump is seeking an unprecedented rollback of workplace, environmental and consumer protections. There are signs that at least one agency in the Trump Administration may not waiting for the legal changes to take effect before providing relief to business. In the eight weeks since the inauguration, the regulatory arms of the Labor Department appear to have been in a near state of suspended animation, at least in terms of their announced enforcement activity. Take the case of the Occupational Safety and Health Administration. Since the inauguration it has not posted a single press release about an enforcement matter on the DOL website. This compares to more than 70 releases — about the filing of cases or the imposition of penalties — posted during the same period last year. This can’t be explained by delays in a new administration getting up and running. During the comparable time period for the newly installed Obama Administration in 2009, OSHA made more than 30 enforcement announcements. A similar pattern can be seen at DOL’s Wage and Hour Division, which under the Obama Administration aggressively pursued employers that violated minimum wage, overtime and other provisions of the Fair Labor Standards Act. Since January 20, the WHD has made only one case announcement. By contrast, during the same period last year WHD announced 35 cases in which an employer was being sued or had settled allegations by agreeing to pay back wages and sometimes a monetary penalty. In 2009, right after Obama took office, the WHD announced 14 cases in the same period. Other parts of the Labor Department are also quiet. The Office of Federal Contract Compliance Programs, which makes sure government contractors comply with anti-discrimination laws, has not issued a single press release since inauguration day — on enforcement matters or anything else. Enforcement is handled by career employees of the DOL, whose activities should not be affected by the delays in filling the Labor Secretary’s job, unless their work is being impeded by Trump’s appointed “beachhead” officials now running the department. There are no indications that the work of DOL agencies has been suspended. Yet the almost complete disappearance of enforcement announcements may indicate that the Trump appointees have been holding up case resolutions or are choosing not to publicize those matters that have been resolved. 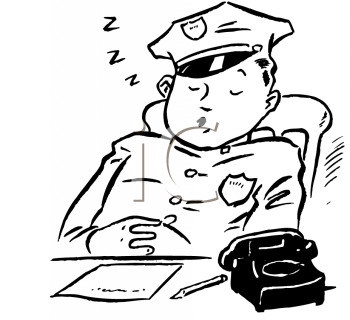 In any event, this enforcement lethargy may be a rehearsal for things to come. The Trump budget blueprint calls for a 21 percent reduction in DOL funding, and while the document provides limited details on what would be targeted, a cut of that size is bound to impair enforcement. How many workers who voted for Trump were seeking more dangerous conditions on the job and greater vulnerability to wage theft? UPDATE: It’s been pointed out to me that despite the absence of OSHA press releases the agency is still posting enforcement actions on its website on this page, which shows numerous cases since Inauguration Day. The two biggest corporate crime stories of 2016 were cases not just of technical lawbreaking but also remarkable chutzpah. It was bad enough, as first came to light in 2015, that Volkswagen for years installed “cheat devices” in many of its cars to give deceptively low readings on emissions testing. Earlier this year it came out that the company continued to mislead U.S. regulators after they discovered the fraud. VW has agreed to pay out more than $15 billion in civil settlements but it is not yet clear what is going to happen in the ongoing criminal investigation. Brazenness was also at the center of the revelation in August that employees at Wells Fargo, presumably under pressure from managers, created more than one million bogus accounts in order to generate fees from customers who had no idea what was going on. The story came out when the Consumer Financial Protection Bureau announced that the bank would pay $100 million to settle with the agency and another $85 million in related cases. But that was just the beginning of the consequences for Wells. CEO John Stumpf was raked over the coals in House and Senate hearings, and he subsequently had to resign. Criminal charges remain a possibility. The other biggest corporate scandal of the year involved drugmaker Mylan, which imposed steep price increases for its EpiPens, which deliver lifesaving treatment in severe allergy attacks. The increases had nothing to do with rising production costs and everything to do with boosting profits. The company’s CEO was also grilled by Congress, which however could do little about the price gouging. Toxic Securities. 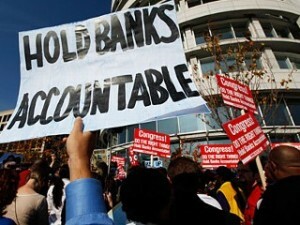 There is still fallout from the reckless behavior of the banks leading up to the 2008 financial meltdown. Goldman Sachs paid more than $5 billion to settle a case involving the packaging and sale of toxic securities, while Morgan Stanley paid $2.6 billion in a similar case. Mortgage Fraud. Wells Fargo had to pay $1.2 billion to settle allegations that during the early 2000s it falsely certified that certain residential home mortgage loans were eligible for Federal Housing Administration insurance. Many of those loans later defaulted. False Claims Act. Wyeth and Pfizer agreed to pay $784 million to resolve allegations that Wyeth (later acquired by Pfizer) knowingly reported to the government false and fraudulent prices on two of its proton pump inhibitor drugs. Kickbacks. Olympus Corp. of the Americas, the largest U.S. distributor of endoscopes and related equipment, agreed to pay $623 million to resolve criminal charges and civil claims relating to a scheme to pay kickbacks to doctors and hospitals in the United States and Latin America. Misuse of customer funds. Merrill Lynch, a subsidiary of Bank of America, agreed to pay $415 million to settle Securities and Exchange Commission allegations that it misused customer cash to generate profits for the firm and failed to safeguard customer securities from the claims of its creditors. Price-fixing. Japan’s Nishikawa Rubber Co. agreed to plead guilty and pay a $130 million criminal fine for its role in a conspiracy to fix the prices of and rig the bids for automotive body sealing products installed in cars sold to U.S. consumers. Accounting fraud. Monsanto agreed to pay an $80 million penalty and retain an independent compliance consultant to settle allegations that it violated accounting rules and misstated company earnings pertaining to its flagship product Roundup. Consumer deception. Herbalife agreed to fully restructure its U.S. business operations and pay $200 million to compensate consumers to settle Federal Trade Commission allegations that the company deceived customers into believing they could earn substantial money selling diet, nutritional supplement, and personal care products. Discriminatory practices. To resolve a federal discrimination case, Toyota Motor Credit Corp. agreed to pay $21.9 million in restitution to thousands of African-American and Asian and Pacific Islander borrowers who were charged higher interest rates than white borrowers for their auto loans, without regard to their creditworthiness. Sale of contaminated products. B. Braun Medical Inc. agreed to pay $4.8 million in penalties and forfeiture and up to an additional $3 million in restitution to resolve its criminal liability for selling contaminated pre-filled saline flush syringes in 2007. Pipeline spills. To resolve allegations relating to pipeline oil spills in Michigan and Illinois and 2010, Enbridge agreed to pay Clean Water Act civil penalties totaling $62 million and spend at least $110 million on a series of measures to prevent spills and improve operations across nearly 2,000 miles of its pipeline system in the Great Lakes region. Mine safety. Donald Blankenship, former chief executive of Massey Energy, was sentenced to a year in prison for conspiring to violate federal mine safety standards in a case stemming from the 2010 Upper Big Branch disaster that killed 29 miners. Wage theft. A Labor Department investigation found that Restaurant Associates and a subcontractor operating Capitol Hill cafeterias violated the Service Contract Act by misclassifying employees and paying them for lower-wage work than they actually performed. The workers were awarded more than $1 million in back pay. False advertising. For-profit DeVry University agreed to pay $100 million to settle Federal Trade Commission allegations that it misled prospective students in ads touting the success of graduates. Trump University. Shortly after being elected president, Donald Trump agreed to pay $25 million to settle fraud allegations made by the New York State Attorney General and others concerning a real estate investment training course. Remember: thousands of such cases can be found in the Violation Tracker database my colleagues and I at the Corporate Research Project of Good Jobs First produce. Look for expanded coverage in 2017. You can also read the Digest via its Facebook page.